This Summer I’ve discovered a lot of really good things. Farmer’s markets. Romance. Gluten-free breads. Coconut flour. Trader Joe’s Fig Jam. Adorable red skinny jeans. Chocolate nut butters. Oatmeal pancakes. Tzatiki. California. Traveling. Writing. Letting go of inhibitions. I have to say starting brand new has been the best experience yet; because what is life really without a little bit of adventure? 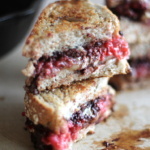 Or crazy weird (and delicious) grilled cheese sandwiches for that matter? I enjoy living life as it comes. Mostly through food experiences. And let me tell you, raspberry jam is simply the best there is. Seriously grape jelly weirds me out. But maybe that’s because I’m used to seeing it in that creepy Welch’s squeezable container. Are we on the same page here? Probably not, because I have no idea where I’m going with that. I really just wanted to tell you how much I love raspberry jam. I don’t think I could live a week without it. …Or a week without looking at Ryan Lochte. Oh, sorry. Back to the jam. Raspberry jam is just this thing that goes perfectly with all the other good things in life… you know like cupcakes and whip cream or sandwiched in s’mores. Oh let’s be reminded that it’s the perfect topping for peanut butter pie. Once I brought raspberry jam swirled-dark chocolate brownies over for a dinner party. They were really, really good. Apparently so good that the guy who ate them tried to ask me out on a date. That’s not a joke. The world is a weird, weird place sometimes. Especially when you find out that raspberry brownies cast magical love spells. I can contribute to the weirdness of the world I guess. 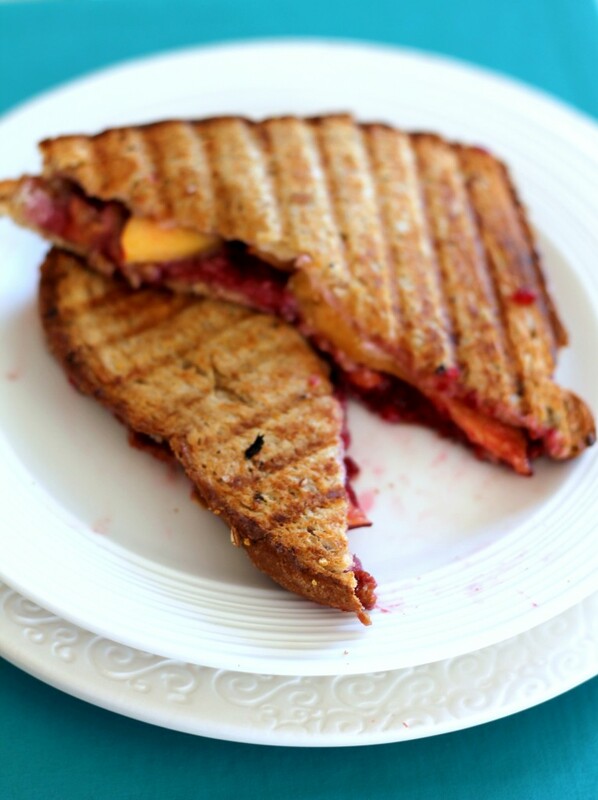 I mean, I put raspberry jam, goat cheese and peaches in a sandwich, grilled it, then watched the Bachelor Pad. Despite my weirdness, the sandwich was delightful. 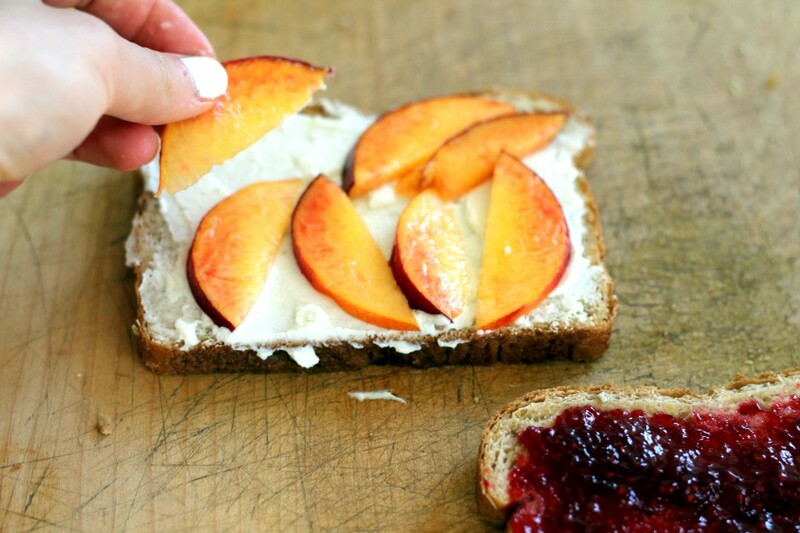 Tart goat cheese, raspberry jam, and bright ripe peaches made it the perfect quick summer meal. Because I realize that we can’t make salmon and pancakes everyday. If you’re anything like me, half the time you want to bury your face in a bag of Sun Chips for lunch and save the other half for dinner. 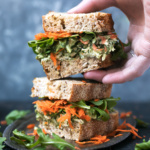 But let me tell you that I really do like this sandwich, it’s easy to pull together and full of bright fruity summer flavors. WAIT… are you thinking what I’m thinking? 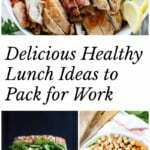 Crunchy Sun Chips in the sandwich? Preheat a non-stick skillet over medium heat. Butter one side of the bread slices. Place one slice of bread butter side down on the pan. Add goat cheese and place peach slices on top. 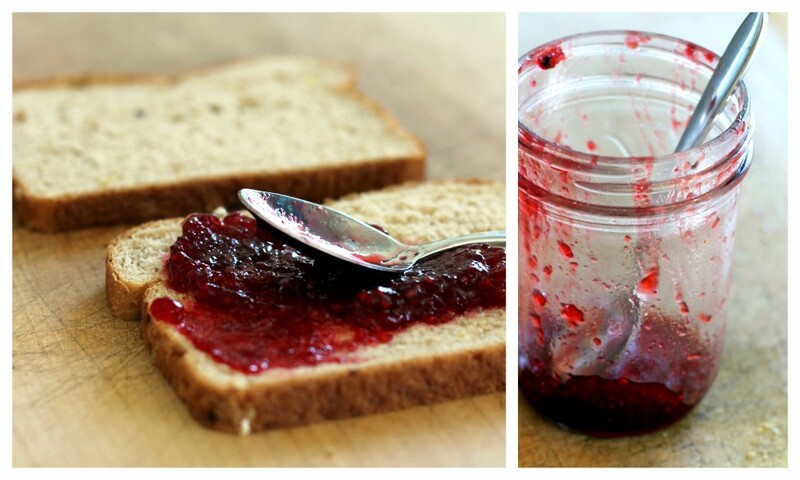 On other bread slice, spread raspberry jam on the side without the butter; place butter side up on top. 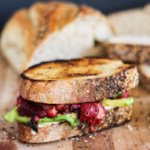 Grill/Cook the sandwich for 4 minutes or until cheese begins to melt and the bread begins to turn golden brown. 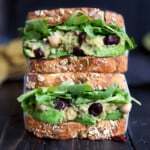 Flip the sandwich with a spatula and cook for another 2-4 minutes or until the bread golden brown on the opposite side and cheese is thoroughly melted. Remove from pan, cut in half and enjoy. 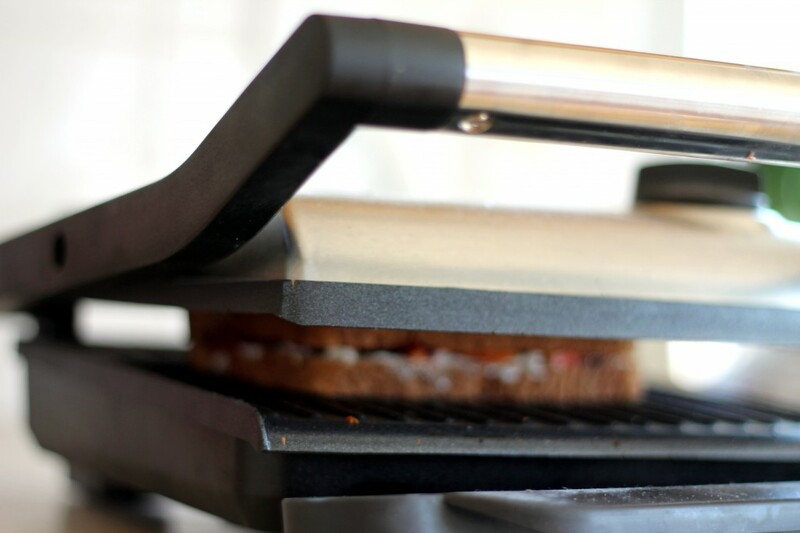 This can also be made with a sandwich maker, if desired. 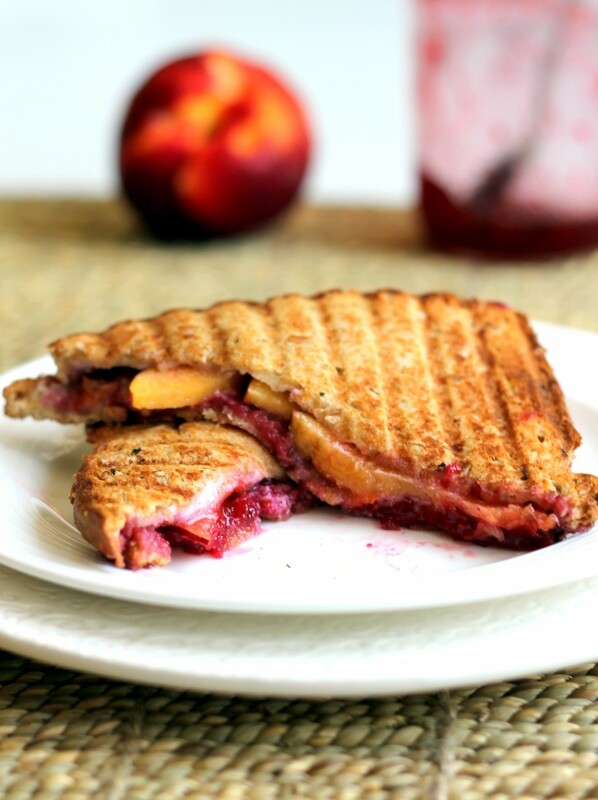 7 Responses to "Grilled Goat Cheese Sandwiches with Peaches + Raspberry Jam"
Yumm!! 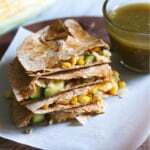 I totally make something like this all the time- instead I add thin sliced turkey and a spiced raspberry jam! OMG- you would love it! I found it at the Mill City Farmers Market but if you find any in Cali, try it!! Yum!! I don’t have a pannini maker. Will a waffle maker work? Also, is there a lower calorie option for the goat cheese? Maybe cottage cheese or some sort of greek yogurt? I haven’t tried these in a waffle maker, but let me know if you do! You could also just make this on a skillet on the stovetop 🙂 I probably wouldn’t recommend cottage cheese or greek yogurt (they’re pretty liquid-y and not great for melting). Okay sounds good! 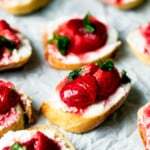 I bought some low fat ricotta cheese to try, with organic strawberry fruit spread and mango. I plan to try it this weekend! OMG YUM!! 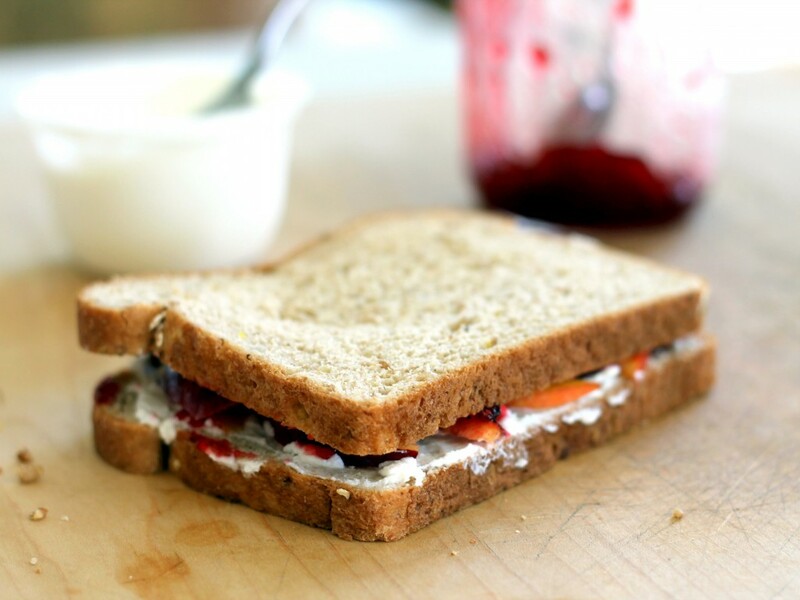 Do you think this sandwich would taste okay with fig fruit spread instead of strawberry?